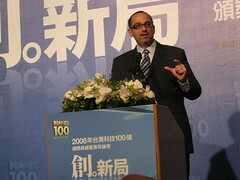 One of the things AMD invited Nate and I to attend while we’re in Taipei was the Info Tech 100 presentation where Pat Moorhead did a keynote speech. We went in not knowing just how prestigious this event was and as a result, we were grossly under-dressed (nothing like playing the ugly American). It never occurred to me that I needed to know how to read the characters for vice president, food and basic communication seem like better survival skills. I guess I was slightly better off than the guy I saw desperately trying to get some sort of poop off his shoe in the bathroom prior to the event. 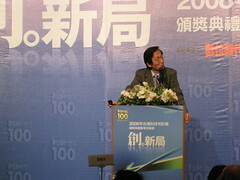 The event kicked off with an introduction and award presentation by Vincent Siew, Vice President of Taiwan, complete with ear piece wearing security detail. I’m pretty sure if it had been the US Secret Service, we’d have been booted from the room. 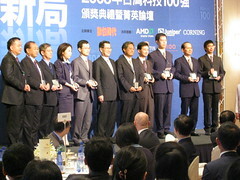 Awards were presented for the top 10 of the Info Tech 100 and then also for the companies that made it on both the Taiwan list and the Business Week Info Tech 100. 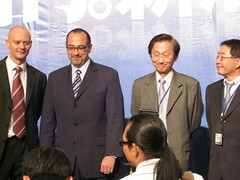 The CEOs of ASUS and HTC were both on hand to receive awards, along with a long list of other highly successful Taiwan tech companies. After a brief intermission and the departure of the Vice President of Taiwan, Pat Moorhead kicked off the four keynote presentations offering a succinct look at AMD’s broad vision of the future (or what I will refer to in a future post as how AMD is saving Windows Vista). The day closed with a keynote from Jonney Shih of ASUS. Sweet, I didnt even think Moorhead knew how to tie a tie. :> No, he’s one of the few veeps who can cover it all from system building to these stand-up stuffy things.